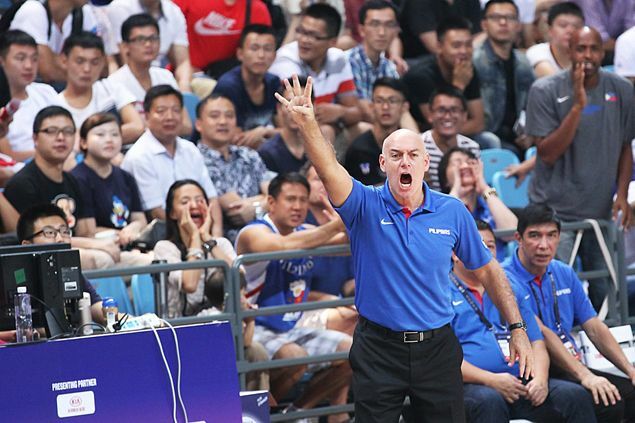 CHANGSHA, China - Gilas Pilipinas coaches, players and fans were left aghast over the officiating in the Fiba Asia Championship final which they felt only made the fight for the gold medal against host China more formidable than it already was. National coach Tab Baldwin was slapped with a technical for continuous complaining and Gilas players became increasingly frustrated over the calls of the referees, losing composure in the process. By then, anger was also mounting on social media. "No comment," said Baldwin when asked about the officiating later. "That would only open a can of worms." Inside the Changsha Social Work Colleges gymnasium where the final was played, former national coach Chot Reyes was the first to air his thoughts about officiating - a sentiment no doubt shared by outnumbered Filipinos and many more watching on television. "The way we started gave us a really good chance. Sobra lang talaga yung officiating," said Reyes, coach of the Gilas team that also finished runner-up in the 2013 Fiba Asia in Manila. "Coming into this game we have expected that. 'Yun naman ang sinabi ni Tab sa team eh." Gabe Norwood, one of the most soft-spoken players of Gilas, also couldn't help but react to the non-calls after he was hit across the face by a wayward Chinese hand without a whistle being blown. "It was hard not to be bothered by it," said Norwood. Gilas was slapped with 28 fouls to the 24 of China, but more glaring were the calls that weren't called on China and the ticky-tacky fouls slapped on the Filipinos. China also was awarded seven more free throws, 33-26, than Gilas. Asked about the officiating, former PBA chairman Patrick Gregorio said: "It's sad (officiating). But everything is part of the game." Gilas assistant coach Norman Black said the officiating was 'horrible' but was quick to add that "we also have to look at the way we played."